We can’t help but wonder why kids love Batman, we can’t blame them though. He’s a superhero that uses the best that he can in his war on crime. If your kid established that love for a persona, then it’s a no-brainer to make it as a central theme for your kid’s birthday party. Birthday parties are special to children and seeing this anticipation from them propels us to make this special day the best one yet. 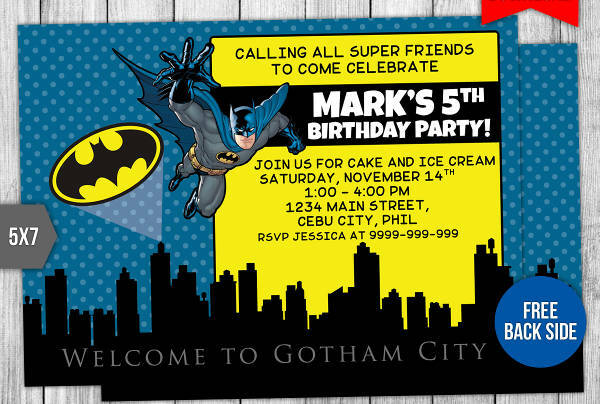 Down below is our list of Batman invitation designs so kids can channel their inner superhero. All are provided in a downloadable format on the website. You may also want to check out our array of free party invitations, convenient for any upcoming occasions. Why do kids love birthday parties? Birthdays would mean we’re a year older, well, literally for adults but for kids, it is a fun celebration. Children’s birthday parties are a get together of families, friends in schools, neighbors etc. We plan on a line-up of enjoyment and serve a delightful array of food to feast on. Through birthday parties, children get to create friendships. Whether you have invited the whole class, close neighbors, and families or attend in their friend’s event, kids learn to socialize and interact with other people. Birthday parties are also a self-esteem booster. This teaches kids about the importance of giving and generosity. When kids get to see all their friends arriving with presents placed in colorful packaging and receiving warm birthday greetings, this is a reassurance of care and love by many people vice versa. Who could also forget gift giving during birthday parties? That excitement and anticipation we see from children as they tear open their presents and revel in the happiness of their favorite toy. Another beautiful thing about birthdays is that as children get older, they always have memories out of these occasions. Bits of details come up for a conversation starter thus creating this sweet nostalgic feeling. You may also view more on our Hello Kitty invitation card designs. 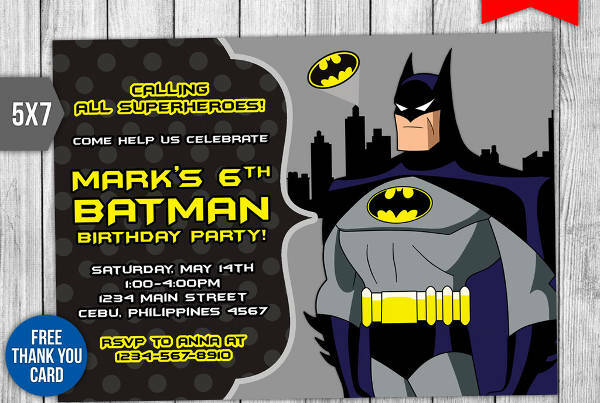 Let’s start with the Batman Birthday Invitation card design. It has a great design to it considering the layout and graphics done. It is available in three high-resolution files and is CMYK print ready. There is a new Batman installment coming in theaters soon. 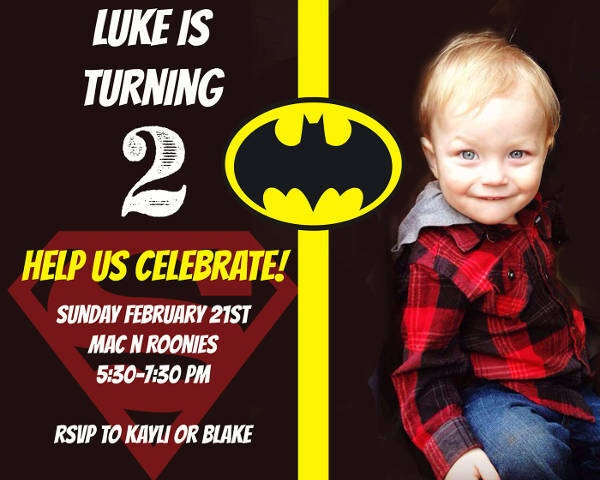 If your kids enjoy Lego and Batman, the Batman Photo Invitation, DIY Batman Invitation, and Batman Lego Invitation are perfect to spice up your party. The three designs are downloadable and easily customizable. 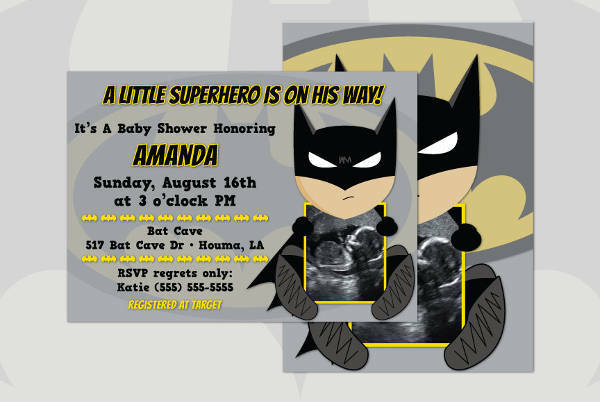 If you are looking for an understated superhero design for your card, the Batman Christening Invitation is a great choice. It is available in varying sizes and the use of color schemes is paired well with the lightness of the illustration. The Batman Invitation Illustration design suggests a pop art inspired style and it features the Gotham City in a silhouette form. This is available in a format that can be instantly downloaded and it comes along with a thank you card. To contrast the common superhero theme here, we also have more to offer. Browse through our list of Minnie Mouse birthday invitations for you to use on your next invitation designing project and for future references.